A MICROPLATE reader incorporating a luminescence module has played a key role in a study of circadian rhythms in insects. 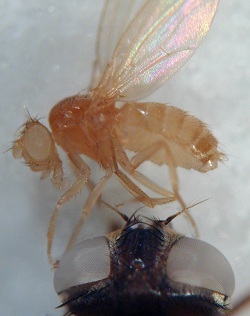 Researchers at the Institute of Entomology (ENTU) in the Czech Republic used an Infinite M1000 from Tecan in their research on transgenic Drosophila. “The expression of circadian genes is studied using transgenic Drosophila containing luciferase reporter genes controlled by the promoter of the gene under study” explains ENTU researcher Dr David Dolezel. “This needed a microplate reader with a luminescence module, equipped with filters to discriminate between red and green luciferases, allowing us to follow multiple genes per well”. Automatic plate transfer was also essential, because the measurements were to be performed automatically at intervals throughout the day and night. Dolezel added: “The Infinite M1000’s compact size means it fits into our incubator, so we can precisely control light and temperature and investigate the effect of environmental variables”. The microplate format enabled the team to load hundreds of flies into the plate reader, automating large-scale screens of mutant Drosophila strains and performing hundreds of measurements over a period of up to two weeks.